What do paintings of men getting gored by bulls, women riding bicycles and a cleaner, more usable planet have in common? Find out tonight, over a cocktail, at the B-tches on Bikes benefit party/silent art auction at The Eldridge (247 Eldridge St., between Houston and Stanton). 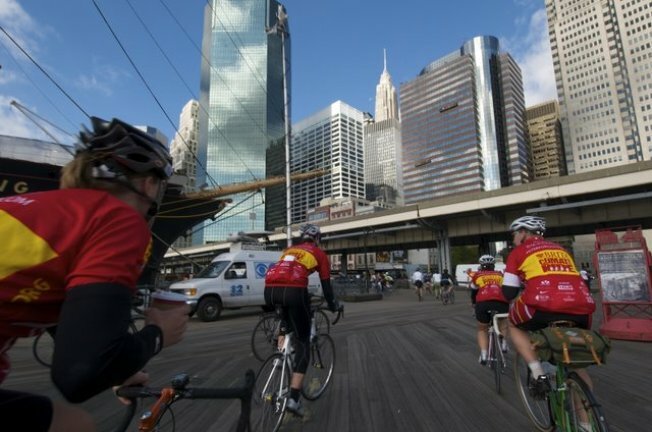 The event is raising money for the annual Climate Ride taking place at the end of September, when the B-tches are joining 200 other cyclists in a 5-day, 300-mile bike ride from New York City to Washington DC. The ride raises both awareness for the environment and some major funding for not-for-profit climate and bicycle-related organizations. Beneficiaries include Focus the Nation, Clean Air-Cool Planet and the Rails-To-Trails Conservancy, which creates “urban pathways” by converting former rail lines into bicycle trials. $10 will get you in the door (and get one lucky B-tch closer to meeting her fundraising goal) and three raffle tickets for the 12 original works of arts being auctioned. To think, sometimes you go to parties just to get drunk.